Nutrition is the study of nutrients—carbohydrate, protein, fat, vitamins and minerals—that are essential for life. You will learn how nutrients are ingested, digested, absorbed, metabolized, stored and excreted. 4 year degree. This does not include the 1-2 years of university level studies required prior to admission to the program. You will study food availability and how the nutrition choices we make can affect our health. You will become an expert in food and nutrition so that you are prepared to help individuals, groups, families, organizations and populations achieve their food and nutrition-related goals through assessment, counselling, management, programming and advocacy. The time periods vary, based on an individual student’s background and professional practice site requirements. Students will be based with the Regina Qu’Appelle Health Region or Saskatoon Health Region, plus will have affiliations with other Health Regions and Tribal Councils. 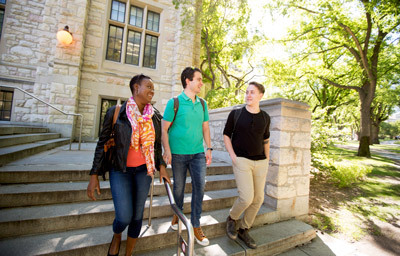 The structure of the University of Saskatchewan's nutrition program is unique in Canada, and is one of only a few that provides students with all of the practical experiences required to practise after graduation. Our practicum program is a partnership with the Regina Qu’Appelle Health Region, Saskatoon Health Region and affiliated health regions and tribal councils throughout the province. The college offers a Pre-Nutrition Club for students interested in the nutrition program. Members take part in social and educational events and receive information about the program and the profession. Pharmacy and nutrition students are among the most active students on campus and in the community. The Saskatchewan Pharmacy and Nutrition Students’ Society organizes a wide range of social, athletic and professional events. Our B.Sc.(Nutr.) students are educated in both the science of nutrition and the profession of dietetics for preparation in a career in dietetics and as a dietitian. Dietitians play a major role in health care, industry, government and education. Dietetics is the profession that translates the science of nutrition into practice. In Saskatchewan, the title "Registered Dietitian", "Professional Dietitian", and "Dietitian" are protected by law - through provincial legislation - so that only qualified practitioners who have met national standards for education and training can use these titles and their protected initials (R.D., P.Dt.). The term nutritionist is not protected by law. People with different levels and types of training and knowledge can call themselves a "Nutritionist". They are not necessarily qualified in nutrition nor are they accountable to a provincial regulatory body. Nutrition and dietetics is an ever-changing and ever-challenging field. Choose to study nutrition and dietetics and you will join a group of professionals who have a positive impact on society and share a gratifying work experience. Assess nutritional status of patients and provide nutrition care; specialize in pediatrics, geriatrics, eating disorders, intensive care, weight management, diabetes, cardiology, nephrology, HIV/AIDS and other areas. Provide expertise to individuals, athletes, sports teams, workplaces and the media. Manage food production and distribution systems. Work with social programs such as food banks and international agencies on hunger and food security issues. Assess nutrition needs of populations and develop health promotion strategies and nutrition education programs. Develop food and nutrition policies, educate future dietitians and conduct research. Advanced studies are needed for university faculty positions. Tuition will vary depending on the type and number of classes you take in a year. This estimate reflects a typical amount you could expect to pay in first year if you enroll in a full course load, the maximum number of courses allowed (2018-2019 Canadian dollar rates). Related work experience is not a criteria for admission, although such experience may help you in answering some of the questions on the Personal Interview as well as you give you an idea if nutrition is right for you. Must complete 30 credit units of required pre-nutrition courses (see below) by April 30 of the year of application. Read through the admission requirements below. Enrolment is limited and, therefore, it is not possible to admit all qualified applicants. Because the number of applicants far exceeds the number of available places, the College strongly recommends that prospective applicants take a program of study which will not only meet the requirements for entry to Pharmacy or Nutrition, but will make them eligible for completion of an alternative program. Applicants require a minimum of one year (30 credit units) of university courses, which must be completed by April 30 of the year of application, to be considered for admission. * The requirement for “English” must include English Literature and Composition. A general “academic writing” course is not sufficient. ** A “6 credit unit” course at uSask is generally a course which includes three lecture hours weekly for a full academic year (approximately 26 weeks); a “3 credit unit” course is one which involves three lecture hours weekly for one term (semester, approximately 13 weeks). Such courses may also include additional laboratory or tutorial components. Elective deficiency - applicants who have a deficiency in 6 credit units of psychology or sociology or electives may be considered, only if they have completed 30 credit units and the courses they have taken instead of the electives are included in the Nutrition program.The deficiency must be completed prior to entry into the second year of the B.Sc. (Nutr.) program. Completion time - you do not have to take all 30 cu in one academic year. However, prerequisite courses completed more than 10 years ago are not normally considered for credit as part of the admission application and will need to be repeated. As each situation is unique, students can request a review by contacting the College directly. only a passing grade is required, but Nutrition is essentially “science-based”. Therefore, it is important to have a strong background in sciences, particularly chemistry, to be successful. Refer to course equivalences chart for a listing of courses at many universities/colleges that are considered acceptable equivalencies. You can submit to Diane Favreau a detailed course outline (not calendar description) for evaluation for courses not listed on the chart or any questions for any other concerns about equivalency of courses taken at other institutions. average is calculated using all post-secondary (college, university and technical schools) courses taken by the applicant including failures but excluding graduate-level courses. if courses are repeated, they are treated as follows: in the calculation of the “prerequisite component” of the admission average, the higher of the two grades is used, unless the original grade was greater then 60%, in which case an “average” of the two grades is used. In the calculation of the “cumulative average component” of the admission average, an average of the two grades is used. The College does not encourage applicants to repeat courses unless a failing grade has been obtained. Applicants are required to attain a minimum level of achievement on the Test of Critical Skills to be considered for admission, regardless of the performance on other criteria. For the 2019 admission cycle, the Test of Critical Skills will be completed at testing centres on Saturday, March 16, 2019. The start time is 10:00 AM (or at the time scheduled by the Test site in your area). Candidates will be given one hour to complete the Test of Critical Skills. Please consider carefully the testing centre for which you register, since changes may not be possible after your application has been processed. Choose the centre closest to where you will be residing at the time the test will be taken. Anyone appearing at a centre for which they are not registered will be denied entry and will be ineligible for admission consideration. Any additional costs for Test administration at sites outside of Saskatoon or Regina must be paid by the applicant. If a candidate cannot write at one of the designated sites, written documentation explaining why an alternate test site is required must be provided to the Associate Dean, Academic, Dr. Yvonne Shevchuk at yvonne.shevchuk@usask.ca – prior to the February 15 application deadline. Only alternate test sites in Canada will be considered. For candidates whose religious convictions prohibit their testing on a Saturday, or who are unable to write on Saturday due to other documented commitments, individual testing arrangements will be made for an alternate date: Monday, March 18, 2019. To request such a special administration, each candidate must provide written documentation specifying that an alternate administration date is needed, and include supporting evidence in support of the request (e.g., a letter on letterhead from a rabbi, pastor, or religious leader) and send it to Dr. Yvonne Shevchuk at yvonne.shevchuk@usask.ca. Candidates who are registered with Disability Services for Students should discuss their situation and possible requirements for writing the Test of Critical Skills with Dr. Yvonne Shevchuk before the application deadline of February 15. Additional documentation may be required. Notices confirming registration at the chosen test centre will be emailed to all applicants whose completed and paid applications have been received by the College by the February 15 deadline. Each applicant should receive the registration/test centre confirmation notice no later than March 14, 2019. If you do not receive the required information by March 15, 2019, you must contact our office at 306-966-6368 as soon as possible to obtain your registration. You will need to bring this to the exam. See test rules below. Arrive at least 30 minutes ahead of the scheduled testing time at the designated test site. All candidates must be registered and seated in the exam room 5 minutes before the test begins. Testing will begin promptly at 10:00 a.m. (or at the time scheduled by the Test site in your area) and will end at approximately 11:00 a.m.
You must present positive photo identification such as a driver's licence, school identification card or valid passport when you check in at the testing centre. Your identification must include a recognizable photograph and signature. Items such as photo ID credit cards are NOT acceptable. Bring an extra pen with you to the writing centre. No aids such as dictionaries, books, notes, or electronic devices will be allowed. NO OTHER INDIVIDUALS WILL BE ADMITTED TO THE TESTING CENTRES. The Test of Critical Skills is in essay format. Candidates are asked to write a formal, persuasive academic essay, of at least 300 words (maximum 500 words), in response to a proposition drawn from a short reading. The topic of this essay will not be directly related to pharmacy or nutrition. Applicants are required to attain a minimum level of achievement on the Test of Critical Skills to gain consideration in the final selection (regardless of the performance in other criteria). the command of expression, grammar, and punctuation demonstrated in the response. There will be no face to face interviews. Once you have applied and paid the application fee, you will receive instructions for accessing the video interview process. If you do not receive instructions for accessing the video interview process within two weeks of your application and payment, please contact our office at (306) 966-6368. The video interview must be conducted between January 15 and February 28, 2019. An internet connected computer with a functioning webcam and microphone or smart phone is required. To prepare for the Personal Interview, the College encourages all applicants to investigate the profession of Nutrition/Dietetics. Although the specific focus of the individual Interview questions may shift from year to year, you should be prepared to discuss why you have selected nutrition as your choice of health care profession, your exposure to the profession, and how you perceive the role of the dietitian. Direct nutrition/dietetics experience is not a specific admission requirement, but if you have gained such exposure you may be better prepared to respond to at least one of the questions in the Interview. If you are unable to gain work or volunteer experience directly related to the profession you should explore other options which would help enhance your knowledge of the profession. You should also reflect upon your previous life/work experiences and how ‘transferable’ they are to those attributes expected of a student in a health care profession. Applicants whose primary language is not English must present evidence of proficiency in English. Ranking for admission is based upon academic performance and personal qualities. Because there are three components to the admission score, it is important for applicants to perform as well as possible on all three components. There is no average which will guarantee admission. It is possible that an applicant with a high average (e.g. 80%) will fail to gain admission because of a poor performance on the Test of Critical Skills or Video Interview. Conversely, applicants with lower academic standing sometimes achieve a high non-academic assessment which can raise the overall admission score. In the final selections, only applicants who meet minimum standards in each component (e.g. in the admission average and in the non-academic assessment) and whose overall “admission score” is high (relative to the other applicants) will be offered admission. Because of the large numbers of highly qualified applications we receive, most individuals offered admission have had averages well above 70%. Enrolment quota - There are 28 first year seats. Applicants must have lived and worked full-time in Saskatchewan for at least 12 consecutive months prior to admission without being a full-time student. To qualify, you must pay income taxes in Saskatchewan and have a Saskatchewan health card. You cannot qualify for residency by attending school if your home is elsewhere. Applicants from border communities (e.g., Lloydminster, AB and Flin Flon, MB), residents of the Yukon, Northwest Territories and Nunavut, members of the R.C.M.P. or the Canadian armed forces, graduates of the University of Saskatchewan, and children or spouses of graduates of the University of Saskatchewan are considered Saskatchewan residents for the purpose of their admission application to Pharmacy or Nutrition. Up to 4 of 28 positions may be offered to out of province and international applicants. There are two spaces in the first year for qualified Aboriginal applicants. Applicants must supply proof of Aboriginal ancestry. If there are more applicants to the Education Equity Program than spaces, then students are selected on the basis of admission selection criteria. Applicants who wish to be considered for the Education Equity Program are requested to indicate this on their application forms. One Saskatchewan student may be admitted under special circumstances or for compassionate reasons. Any Saskatchewan resident can apply in this category if they feel there are circumstances which merit special consideration. For example, if someone has had a health problem or some personal circumstance which has impacted their academic average in a pre-year, they should write a letter documenting the situation. Additional supporting documentation must also be submitted (e.g. medical information, funeral notices, etc.). Applications which are not considered in the special consideration category are automatically considered in the Saskatchewan resident pool. Applicants applying under this category are considered on a case-by-case basis. This position may not be filled every year. Applicants who have previously attended the College of Pharmacy and Nutrition (and completed at least one full semester in the program) may be considered for readmission under this category. If you are currently enrolled in university courses, you are encouraged to apply AFTER receiving first term grades in January, when you know that your academic average will meet the minimum requirement. Late applications are not considered under any circumstances. The Admission Scores of applicants who have met the minimum standards for all admission criteria (as described above) are calculated as soon as all data is received. Because the last date for receipt of transcripts is June 1st, the admission decisions cannot be completed until mid-June. Letters via email to the individuals selected for admission will be sent in late June, offering positions in the first year classes of Pharmacy or Nutrition, according to established quotas. Individuals will have approximately 7-10 days to respond to this offer. You cannot defer entry to the program until the next year since the number of applicants far exceeds the number of available places, we are not able to reserve admission spaces for future years. When we send you an offer of admission, we will also send information about the program of study (i.e., the classes to take in each year) and a copy of your individual program record. If you have been granted any credits for courses you have taken, this will be reflected on the record form. Once you have accepted admission to Pharmacy or Nutrition you will receive registration information from the University, and you must register for all the courses in the first year of Pharmacy or Nutrition (for both terms) by accessing the PAWS registration system on-line. Spaces in required courses are guaranteed for all our first year students. If you have already registered in some courses (e.g., in the College of Arts and Science) by the time you are offered admission to Pharmacy or Nutrition, you will be removed from those courses by Student and Enrolment Services Division and switched into our college which will then allow you to register for your courses. A certain number of the remaining qualified applicants are placed on waiting lists (usually approximately 20 applicants), and are also informed of their status by email in late June. If an applicant declines the offer of admission, the next person on the waiting list is contacted. Generally, the admission process is complete by late July, but occasionally the College has accepted students from the waiting lists right up to mid-September. Once quotas are filled, all remaining applicants on the waiting lists are so informed by email. The remaining qualified applicants who are not offered admission also receive an email in late June. Applicants who are unsuccessful are notified as soon as possible. Applicants are told the reasons for their lack of success (e.g., failure to achieve the minimum admission average, incomplete transcripts, prerequisites not met and/or failure to meet the critical skills performance standard) but individual results on the Test of Critical Skills or the Personal Video Interview, and subsequent Admission Scores are not released. Two waiting lists are created - a “Saskatchewan residents” list and a “Non-Saskatchewan residents” list. The numbers on the waiting lists vary each year, but generally we place up to 25 names on the wait lists. The number of individuals from the waiting lists who are actually offered admission also varies each year. For example, in 2014, and 6 applicants from the Saskatchewan resident list and 2 from the non-Saskatchewan waiting list were offered admission. If you have completed the prerequisites for Pharmacy and/or Nutrition, you should choose an alternate degree program (e.g., B.Sc., B.A.) and take courses which will lead toward that degree. There is no guarantee that your application to Pharmacy or Nutrition will be successful on subsequent application(s) - we expect that competition for available entry positions will remain high. Therefore, you should NOT take courses at random, and you should not take courses that are included in our degree programs unless they are also needed for your alternate degree. To determine what courses you need to take to complete another degree, you should consult the appropriate College or Department offices. If you wish to continue at the university and wish to improve your academic average, you would be well advised to take courses in which you can do well. You should also think about developing or improving your skills in reading, writing and critical thinking, and to investigate the Pharmacy or Nutrition profession. No preference is given to applicants who have completed several years of study or to those who may already completed a degree(s). Each year you apply you are competing with new applicants and are ranked relative to the performance of the others. It is not possible to get into Pharmacy by being admitted to Nutrition and then transferring to Pharmacy after one year. You would have to reapply to enter Pharmacy and would have to meet all requirements, including writing the Test of Critical Skills and completing the Video Interview again. You would be competing against all others who are also interested in admission to Pharmacy in that year. Your grades in the first year of the current program would be included in the calculation of your admission average. The Bachelor of Science in Nutrition - B.Sc.(Nutr.) 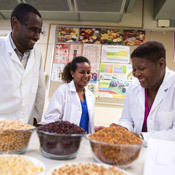 degree is offered by the University of Saskatchewan's College of Pharmacy and Nutrition. Established as the School of Pharmacy in 1913, the College of Pharmacy and Nutrition now has a unique combination of two health disciples and professional programs, and serves as a model for integrating health promotion and education, health care delivery, interdisciplinary research, and community outreach and engagement.The College offers students a nationally accredited program, leading to an outstanding range of careers.